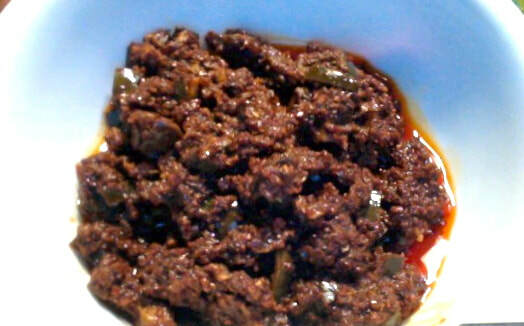 Tomato Pickle or Tomato Ooragaya in Andhra Style. Wash the tomatoes and wipe them. Cut them into small pieces. Remove the seeds and tough fibers from tamarind. Dry roast fenugreek seeds and mustard seeds separately until they have nice aroma on low medium flame. Allow them to cool down and then make a fine powder. Have a clean and dry glass bottle or jar ready. Take the tomato pieces into the jar and add salt and turmeric powder. Let them soak for 48 hours or 2 days. On the 3rd day, you will notice that a lot of juice came out of tomatoes. Squeeze out the tomatoes and spread them on a plate. Leave out the juice in the jar. Dry them under the Sun until the tomato pieces are completely dry and become crispy. Soak the tamarind in the tomato juice. 1. Spread the tomato pieces on a plate or on a cloth. Place it under the Sun and cover them with a cloth or net. Dry them until they are crispy. 2. Put them in a dehydrator and dry them until they are crispy. 3. Turn on your oven to its' lowest temperature and place the tomato pieces in it. Dry them until they are completely dry and crispy. Mix them in between so that they don't get black or brown. When your tomato pieces are ready, grind the soaked tamarind, along with tomato juice. 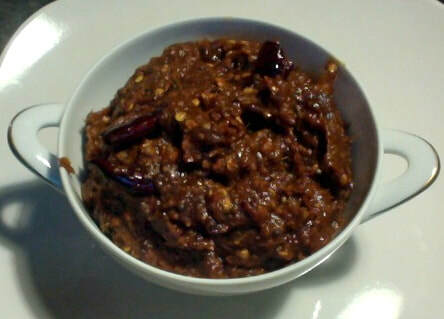 Take the tamarind mixture into a bowl. 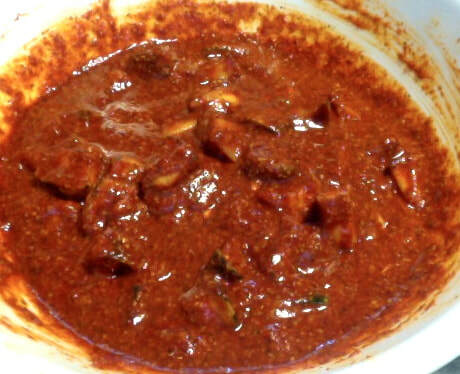 Add red chili powder, fenugreek powder and mustard powder. Also add the dried tomato pieces. Mix them well. Take the oil in a pan which is on medium heat. When the oil is hot add chana dal, urad dal,mustard seeds and cumin seeds. Stir them. When the mustard seeds are popping up add red chilies by pinching them into small pieces. Add hing and curry leaves. Then add the prepared tomato pickle. Mix it well.